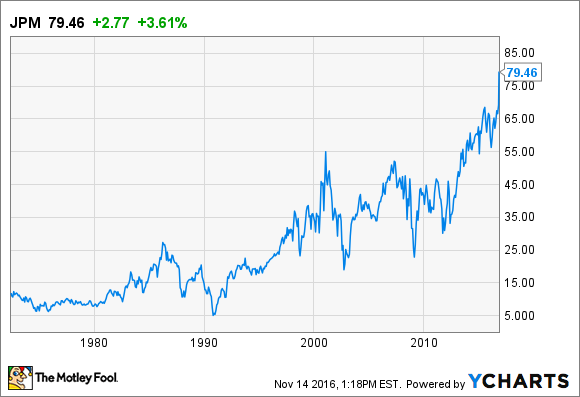 Shares of bank stocks have surged since the presidential election last week, pushing JPMorgan Chase’s stock price to a new all-time high. JPMorgan Chase Chairman and CEO Jamie Dimon is allegedly being considered for Treasury Secretary in President-elect Donald Trump's administration. Image source: JPMorgan Chase. Last week's presidential election was the best thing that's happened to bank stocks since well before the financial crisis. JPMorgan Chase (NYSE:JPM) has been one of the biggest beneficiaries of this trend, with its shares breaching new all-time highs on a daily basis. All told, JPMorgan Chase's stock has climbed 13% since before the presidential election last Tuesday. Today alone, its shares are up nearly 3% halfway through the trading session. The surge in bank stocks since the election is being fueled by President-elect Donald Trump's campaign promises to increase economic growth in the United States. His strategy is to do so through a combination of tax breaks, lower regulation, and higher government spending. Higher government expenditures to improve things like bridges, roads, and airports would serve as a particularly potent economic stimulant. Thanks to British economist John Maynard Keynes, it's been well-known for nearly a century now that the best way to get an ailing economy rapidly growing again is to offset lagging consumer expenditures with higher government spending. Not only would this boost the nation's gross domestic product, or GDP, but it would also almost certainly spur inflation -- both of which are great news for bank stocks, and JPMorgan Chase in particular. A faster growth rate would spur loan demand, which is the most important financial product banks sell. And higher inflation would translate into higher interest rates and thus wider profit margins from the loans that are made. Earlier today, The Wall Street Journal reported that economists have raised their forecasts on both counts. Economists now expect the U.S. economy to grow at 2.2% in 2017 and 2.3% the following year, compared to only about 1.5% over the past 12 months. And they expect inflation to come in at 2.2% next year, which would be the first time the figure has eclipsed the Federal Reserve's 2% threshold since the 2008 crisis. 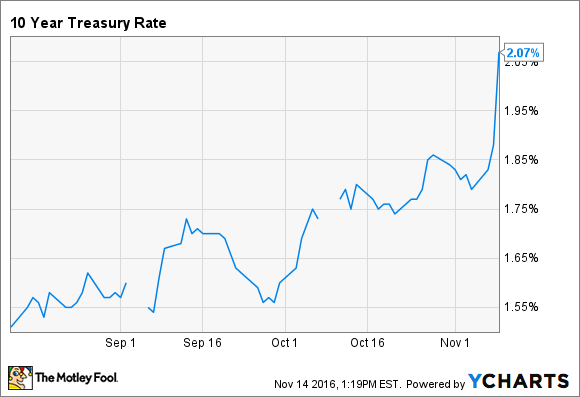 In response to expectations like these, traders sent the yield on 10-year Treasury bonds soaring on Monday. After beginning October at 1.7%, the benchmark long-term rate is now above 2%. 10-Year Treasury rate data by YCharts. If forecasts like these prove to be accurate, it will very likely lead to a surge in bank profits. In JPMorgan Chase's latest regulatory filing with the Securities and Exchange Commission, the bank estimates that a boost of 100 basis points to short- and long-term rates will translate into an added $2.8 billion in annual net interest income. That's not as big of a game changer for JPMorgan Chase as it is for, say, Bank of America, which would earn twice as much under a similar scenario, but it would still equate to a roughly 12% increase to JPMorgan Chase's profits based off last quarter's figures. It's important to point out as well, that Trump's promise to roll back regulations on the financial sector is likely to have a similarly positive effect on bank earnings. Trump in particular wants to roll back the provisions of the Dodd-Frank Act that weigh most heavily on the nation's biggest banks -- JPMorgan Chase being the largest of all. If Trump is able to follow through on these promises, it could free up hundreds of billions of dollars' worth of assets on JPMorgan Chase's balance sheet, which could then be deployed more profitably into loans as opposed to low-yielding government securities. Along these same lines, any dilution in financial consumer protection laws, which is also a priority of the Republican party, could spur innovation in the industry and reduce regulatory and compliance costs at banks like JPMorgan Chase. In short, while it remains to be seen how much of Trump's campaign agenda will materialize into actual policies, there's little question that any movement in that direction will be good news for JPMorgan Chase.